I’m clearly in the “minimal chemical” camp, yet all my commercial buddies, without exception, depend upon “off label” use of agricultural miticides to keep their colonies alive. These are top-notch beekeepers, and I greatly respect them, learn from them, and have no problems with their methods. The reality is, they would all likely have gone out of business if they had stuck to registered chemicals the last few years. Indeed, there wouldn’t have been an almond crop set in California this year if not for such chemical use! On the other hand, no beekeeper I know likes dumping chemicals into their hives–most are concerned about comb contamination, and are justifiably worried as to how long those chemicals will remain effective. In my own operation, I’m trying to see whether a commercial migratory beekeeper can forego synthetic miticides, and run a profitable business. I’m going into year three, and things are looking pretty good! Disclaimer: I am not licensed to make any pesticide recommendation. I am merely reporting on published information. You should consult your local authority for recommendations. I remember when beekeepers would argue if we should ever put any chemical into our hives. Most of us would reluctantly use Terramycin, or possibly Fumidil. But the thought of intentionally putting synthetic pyrethroids, organophosphates, or other toxic-smelling agricultural chemicals into our hives would have been unthinkable. Indeed, even crusty Andy Nachbaur said in 1995, “If that day comes that I have to get on the pesticide tread mill to be a keeper of bee’s all will know my day has come and gone as a beekeeper.” Funny how one little mite changed all that! Nowadays, commercial beekeepers play miticide roulette: use a chemical until it doesn’t work, then treat with a second or third chemical which may interact with the first and hurt your bees; perhaps find out that you’ve contaminated your combs to the point that they are worthless; or get your honey rejected by the packer; or, worst of all, make the headlines with your contaminated honey, and ruin the honey market for all of us. The flip side was that it gave us the fleeting illusion that we had varroa under control, and didn’t need to invest any effort in developing alternative methods of mite management, removed the economic incentive for the development of resistant bee stocks, and insidiously contaminated our combs. But worst of all, it got us into the Silver Bullet model of giving the mite free rein to build up all season, knowing that we had a weapon in our holster that we could use to blast the mite to Kingdom Come at the end of the season, giving us what appeared to be a fresh start each winter. Beekeepers worldwide embraced fluvalinate. Apistan strips seemed pricey to many, so application by dipping a stick into the ag formulation Mavrik® was quickly (and illegally) adopted. Mite control was cheap and easy, and beekeeping was good. The first signs that the party was about to end appeared in 1992, in the Lombardy region of Italy. After four year’s use, fluvalinate no longer killed the mite, and the term “resistance” entered the beekeeping lexicon. We Americans were slow to listen to the Italians, and suffered our own crashes when resistant mites appeared. Some beekeepers started increasing the doses of fluvalinate applied, others (myself included) used the scary-smelling Checkmite+® strips, promising that we’d try to rotate chemicals to avoid resistance. It only took the mites a few years to laugh at Checkmite, also. At that point, the Industry cried for new treatments, and we were belatedly granted ApiLife Var®–a shift toward the European model of “soft” or “natural” treatments. Many beekeepers, however, turned into kitchen chemists, and tried every concoction of agricultural, acidic, or aromatic chemicals imaginable. Many colonies did not survive the experimentation. The mites generally did. As readers of this series know, bee scientists are telling us that it’s time to move on to mite management that is not based 100 percent upon chemical treatments. That’s not to say that chemicals are necessarily excluded from varroa integrated pest management, but only used sparingly, if at all. For the hobbyist or sideliner, I’ve detailed alternative methods that involve no chemicals. Likely, though, you will need chemical help from time to time, especially if you are exposed to major mite immigration from outside your operation. Commercial operators will understandably look for the most cost effective methods, and chemical treatments are relatively inexpensive, as long as they are efficacious. Scientific research and consumer demand are pointing us toward “natural” chemicals such as formic and oxalic acids, and the essential oils such as thymol. I will cover these in the next article. In this article, I’ll inspect the synthetic acaricides. The trick in varroa management is to find chemicals that kill the mite, but that don’t also poison humans or the bees, plus don’t contaminate the honey. Damn few fit the bill! So clever chemists tweak organic molecules to create synthetic acaricides. 1. They are “smart” in that they eliminate the need for the beekeeper to understand the mite. 2. They are easy to apply, relatively safe to use, and generally don’t get into the honey to any degree. 3. They are relatively inexpensive both in material cost, and for the labor required for application. 1. If the public gets a notion that they are tainting honey, we could kill the market for several years. 2. If we find out that their residue in the combs is harmful to bees, we might have to junk the combs. 3. If you don’t notice when mites have developed resistance, your colonies can crash in a hurry. 4. As long as we use them, we are inadvertently breeding for virulent mites that spread by mainly by killing colonies. Pyrethroids are a class of pesticides with chemical structures similar to pyrethrum, a naturally-occurring substance in chrysanthemums. Pyrethroids are favored due to their low toxicity to mammals, and generally rapid degradation (except in beeswax). Their mode of action is by affecting the sodium channels involved in nerve transmission. The two most common synthetic pyrethroids are tau-fluvalinate (Apistan, Mavrik) and flumethrin (Bayvarol). If not for the ease with which mites develop resistance to pyrethroids, I wouldn’t need to be writing this article. 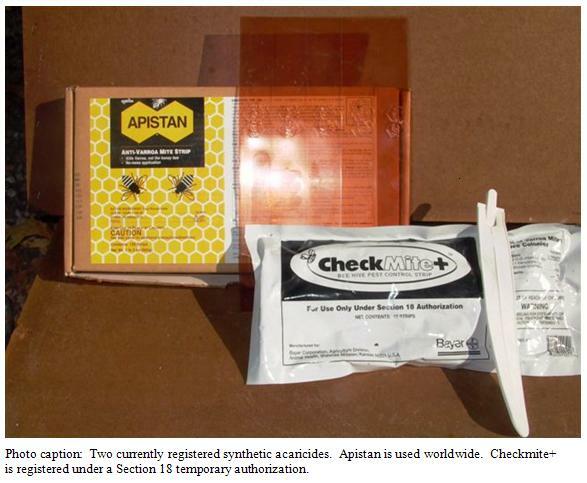 The only registered (and therefore, legal) use of pyrethroids in beehives in the U.S. is in the form of Apistan strips (first released in 1990). The strips are a proven product that provides a measured, slow release of fluvalinate, in a safe form for the beekeeper to handle. Off-label use of agricultural fluvalinate does not. However, I completely understand the temptation for commercial beekeepers worldwide to use the cheaper products. This off-label use of ag chemicals in beehives is the “elephant in the livingroom” of the industry. It’s a huge presence that’s hard to ignore, but we just don’t want to talk about it. I’ll try to defer to industry sensitivities, and discuss it tactfully. Coumaphos is an organophosphate. This is a class of pesticides related to “nerve gas,” and act as acetylcholinesterase inhibitors (they keep nerves “firing”). They are generally toxic to mammals (including humans) at low doses, and can cause cumulative, irreversible nerve damage. The EPA has been phasing out organophosphates, so Checkmite+ was granted only a Section 18 exemption, due to the desperation of the industry. Coumaphos is sold as Asuntol® in France, and as Perizin® in Europe. Coumaphos, which has a relatively low mammalian toxicity in relation to the other organophosphates, is used principally on livestock and poultry to control ectoparasites. According to the Merck Veterinary Manual, dusting adult cattle with as much as a 1% dust can show mild toxicity; a 0.5% concentration can be lethal to calves, sheep, or goats. It gives me pause that a 25% dust base is available for livestock use, and that a careless beekeeper could easily seriously poison himself, or cause headline-grabbing honey contamination by its misuse. Indeed, a beekeeper recently wrote Jerry Hayes in this very magazine asking for advice about using coumaphos powder mixed with powdered sugar! The first time I opened a package of Checkmite+, one whiff told me that handling toxic chemicals wasn’t why I got into beekeeping! A perusal of the medical literature on organophosphates yields the following: “Frequently, the cumulative effects of low doses of organophosphates are neuropsychological. A joint report by the UK Royal College of Physicians and Psychiatrists concluded that a wide range of often-severe symptoms such as excessive fatigue, poor concentration, and suicidal thoughts are reported more frequently in populations exposed repeatedly. Exposed individuals often have a chronic flulike state that improves when exposure ceases. Chronic neuropsychological effects have been seen in 4-9% of patients exposed in occupation-related use.” (Dyro 2007). Maryann Frazier (1999) cautions “Coumaphos is in a group of highly toxic materials called organophosphates. The dermal (absorption through the skin) toxicity of coumaphos to mammals is approximately 20 times greater than that of Apistan. It is therefore imperative that bee-keepers follow all label instructions, including wearing gloves, when using Bayer Bee Strips. With all the treatments necessary to keep bees alive over the past several years, many beekeepers have developed a very casual attitude toward the use of chemicals in beehives. Many consider that if it doesn’t kill the bees, it can’t hurt me. Coumaphos is not a material to be handled casually: misuse of Bayer Bee Strips can lead to serious consequences” [italics mine]. The reader may get the impression that I’m not a big fan of coumaphos in any form for varroa management. The reader would be correct! Amitraz is in yet another class of chemicals—the amadines. Its mode of action is due to two of its metabolic byproducts affecting certain nerve receptors. This chemical was the first miticide for varroa on the U.S. market, in the form of Miticur® strips. Unfortunately, due to an early lawsuit by some beekeepers, the manufacturer yanked the product, and amitraz has not been registered for mite control in the U.S. since. The agricultural formulation Taktic® has, however, become part of the commercial beekeepers repertoire. Mite resistance to amitraz appeared as early as 1999 in the U.S. (Elzen, et al. 2000), yet many beekeepers are currently still using it, although at more frequent intervals, to achieve mite control. Amitraz is registered for use in Europe, in the form Apivar®. It is one of the most widely used miticides there, according to the manufacturer (http://www.beekeeping.com/biove/apivar_2.htm) It is widely used in the Czech Republic, and monitored by the Bee Research Institute at Dol. It is applied there mainly by burning treated strips of paper. Some mite resistance is also occurring in Europe. It is also used in Israel, although mainly for tracheal mite control. I’ve spent some time trying to find any reason not to reregister amitraz as a varroacide in the U.S. I’m not a big synthetic chemical fan, but I think that amitraz deserves a second look. It works well against the mite, appears slow to promote resistance, doesn’t appear to contaminate honey or wax to any extent, and is relatively nontoxic to humans and bees. Hivastan is a brand new product released for varroa control under a Section 18 exemption. Its active ingredient, fenproximate, is a contact miticide that affects electron transport in the mitochondria, and thereby disrupts metabolic processes. This is again a different mode of action than the other miticides. Fenproximate toxicity to mammals is about the same as amitraz. There is a slight bee mortality when first applied. Fenproximate is highly toxic to aquatic life, and should be disposed of carefully. Hivastan is applied in patty form, and the bees transfer the active ingredient throughout the colony while they work to remove the product (which they perceive as a foreign substance) from the hive. Fenproximate is lipophilic, again meaning that it will likely accumulate in the combs. When I asked the company rep how stable it was in beeswax, he replied “very stable.” The company does not yet know whether comb contamination will be a problem, but plans to conduct further evaluations in the near future. There are now three registered synthetic miticides for varroa control in the U.S. All three have different modes of action, and thereby should theoretically be able to be rotated in order to delay mite resistance. There is currently widespread mite resistance to fluvalinate and coumaphos. Fenproximate (Hivastan) has just entered the market. There is also considerable off-label use of a fourth miticide—amitraz, again with a different mode of action. Their safety to humans is in the order (from safest to most toxic) fluvalinate, amitraz, fenproximate, coumaphos. In this author’s opinion, coumaphos should be phased out, and amitraz should gain registration. The ability of pest species to evolve resistance to pesticides is well known. The agricultural community is barraged with advertisements for the latest insecticides and herbicides, developed to take the place of the previous generation that are no longer effective. The surprise to the beekeeping industry was just how rapidly the majority of varroa populations were able to develop resistance to a product–four years for fluvalinate (Milani 2001), three years for coumaphos (Pettis 2004). There are several issues involved in creating resistant mites. Commercial beekeeping practices have tended to create “perfect storms” for the development of pesticide resistance. I’ll detail some of the factors. The actual manner in which a pesticide kills the pest is called its “mode of action.” Some pesticides disrupt the target’s metabolism in several ways, or so overwhelmingly, that it is very difficult for any individual to survive. For example, only two arthropods have evolved on this planet that can live in strong salt brine (the brine shrimp and the brine fly). No other large organisms, plants included, can tolerate the multiple challenges that a high salinity places upon water balance, enzyme systems, nutrient transfer, nerve transmission, etc. Therefore, salt is a very effective pesticide and herbicide (a few tablespoons of salt can kill a human). Unfortunately, salt is not selective, that is, it kills everything, not just the pest. So the trick is to find pesticides that only kill the pest, and leave nontarget species unharmed. In our case, we want to kill the mite, yet leave the relatively closely related honeybee unaffected. The synthetic miticides generally target specific enzymes involved in nerve transmission, although they may have secondary additional effects (Gassner 1997). Therefore, it may only take a single mutation that circumvents or mitigates the chemical action to render the miticide ineffective. The synthetic pyrethroids, which include fluvalinate and flumethrin, are notable for the numerous ways in which pests have developed resistance (Pridgeon 2002). We can expect mites to follow suit. A genetic change that confers resistance to a chemical mode of action often comes at a cost. That cost is a “fitness disadvantage.” For example, in order to resist the action of a pyrethroid, the mite must genetically change the way its nerves function. This changes its overall physiology, with the downside that the pyrethroid-resistant mites do not perform their life functions as well as the non-resistant mites. As a result, the resistant mites can out-reproduce the nonresistant only as long as pyrethroids are being applied to a hive. When the chemicals wear off, the balance is reversed. In general, the greater the cost of resistance, the more quickly the mite population will “revert” to susceptibility. Milani and Vedova (2002) suggest that a synthetic acaricide could remain effective if used only once every several years. In the case of fluvalinate, Elzen and Westervelt (2004) report that a mite population that had become 91% resistant, reverted to 48% susceptibility in only 9 months! Something that has intrigued me is why it seemed that we had little mite problems in both of the years preceding resistance to Apistan, and to Checkmite+. Reports from Italy are that fluvalinate-resistant mites build up only about half as fast as nonresistant mites. My guess is that in those years we were experiencing the slow growth of the resistant mites, as compared to the rapid buildup of the normal mites before them. We thought that we had the mite under control, when in fact it was slowly but inexorably building up a resistant population that then caused widespread colony collapse. Point to note: if you’re depending upon one chemical, and you notice that varroa growth inexplicably slows down, you’d better check to see if you have a resistant population developing! Another undiscussed issue, is the development of honeybees resistant to the sublethal effects of miticides upon the bees. It would be interesting to see if there is a fitness cost suffered by bees which can survive the onslaught of chemicals that are being dumped into some apiaries. Beekeepers are constantly asking for miticides with high rates of efficacy. They turn their noses up at treatments that kill less than 90% of the mites. This attitude may be counterproductive, since the more effective the miticide, the greater the selective pressure for the mite to develop and maintain resistance. If you kill 99.9% of the mites with a certain chemical, the next generation of mites derives its parentage solely from the 1/10th of percent of mites that survived. Any resistant mites will dominate the population in a few generations. From my perspective, we should not be asking for new miticides effecting 95% kills, that will be rendered ineffective due to resistance in four years, but rather, for less lethal miticides that we can use sustainably for the long term. The more times you use a pesticide in a row, the more likely you are to promote pest resistance. In the general case of insect pests, rotation of several pesticides with different modes of action can delay general resistance to any one pesticide. In the case of varroa, however, we’ve had a very limited arsenal of miticides to choose from. Our choices are much greater now, if we include the organic acids and thymol (to be covered in the next article) and biotechnical measures (screened bottoms, drone trapping, sugar dusting). Coupled with mite-tolerant queenlines, we could save the synthetic acaricides for occasional use, only when all else fails. Imagine if fluvalinate were your ace in the hole, that you could always count on, but never used unless you absolutely needed it! Probably a dream, but a totally possible dream, if we could ever get beekeepers to cooperate, and show some forbearance in reaching for the easy cure first time every time. Nearly all mutations are deleterious, and are quickly bred out of a population. However, when something changes in an organism’s environment, the rare mutation may confer some advantage. In the mite’s case, that change is the application of a deadly acaricide, and any mutation that keeps the chemical from killing the mite is a great advantage. 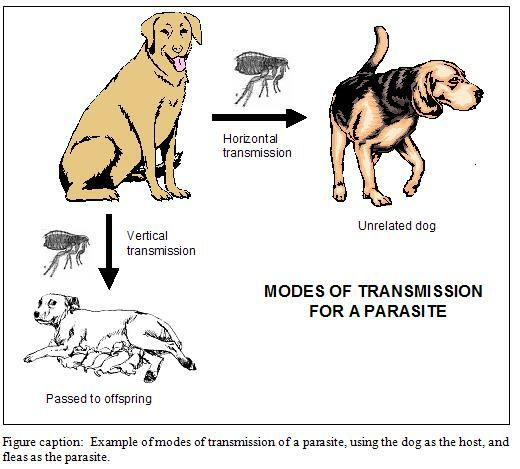 There are two modes of transmission in which a parasite can infect a new host: horizontal or vertical. Varroa can transmit by either mode. However, when we use miticides to “clean up” package bees and splits, we are inadvertently selecting for horizontal transmission. Unfortunately, horizontal transmission is mostly dependent upon mites being dispersed during the robbing of collapsing colonies (Goodwin, et al. 2006). Therefore, regular miticide use de facto selects for the most virulent mites–those that are successful at causing colony collapse! Milani (2001) details how chemical resistance need only occur in a single female mite, and then spread throughout the continent by the robbing out of collapsing colonies! As if resistant mites couldn’t disperse well enough on their own, American beekeepers help them at the task with 18-wheelers. A resistant mite from anywhere in the U.S. is likely to end up in a California almond orchard in February. This year, for example, out-of-state colonies collapsed in staging yards or almond orchards by the tens of thousands. Every single collapsed colony was then robbed out by surrounding beekeepers’ colonies, which were later hauled back home, thereby homogenizing bee diseases and resistant mites throughout the country! Suggestion: don’t move collapsing colonies! Show some courtesy for other beekeepers. Harder suggestion: if you find a single colony not responding to a normally effective chemical, kill that colony and all its mites, and perhaps save the industry millions of dollars. Varroa’s main strength is its ability to rapidly evolve resistance to chemical miticides. The mite has beaten us at the chemical game time and again, yet we keep playing into its hand by trying to fight it at its strong point! Miticides can be very useful tools in varroa management, but only if we don’t overuse them. In order to prevent miticides from contaminating honey, they must not be water soluble. That leaves the lipophilic (fat-loving) chemicals. This seemed fine, since the mites’ chitinous exoskeleton is lipophilic, thereby facilitation the adsorption and absorption of the chemical. In addition, the bees’ bodies would distribute lipophilic miticides throughout the colony. Unfortunately, beeswax readily absorbs lipophilic chemicals. I was extremely curious about the possible sublethal effects of miticides and comb contamination on worker bees’ health and immune systems. It was astounding to me just how little research has been done on this subject! The most widely-used miticide on the planet, tau-fluvalinate (in the forms of Apistan and Mavrik), has been examined by only a handful of studies looking for sublethal effects on the colony. This is especially amazing in that such studies are not rocket science—all you need to do is to take a bunch of mite-free Australian colonies, and load up half with Apistan strips, and measure their behavior, buildup, broodrearing, and resistance to various diseases. One problem with studying comb contamination is the variability of results from different analytical labs (Bogdanov, et al. 2003). As Jerry Bromenshenk has pointed out, any studies of pesticide residues should include blind field-spiked samples. That said, the buildup of some acaricides in combs has been well documented (Bogdanov 1998; Wallner 1999; reviewed in Mutinelli & Baggio 2004). Fries, et al. (1998) clearly found that coumaphos residues in combs had strong effects on mite mortality, fluvalinate less so, and amitraz nearly none. Once a brood cycle had taken place in the combs, the effects disappeared, presumably due to the barrier of the new cocoon. This study dealt with effects upon mites, but might be extrapolated for effects upon bees. A number of researchers have been, and are, concerned about this acaricide buildup. Liu (1992) was one of the first. He warned, “furthermore, the stable, long lasting residue of fluvalinate in the comb wax may exert its action on the developmental stages of the honey bees. It is known that 1-day-old larvae are particularly susceptible to fluvalinate poison.” The manufacturer of Apistan points out, however, that while fluvalinate can accumulate in the wax, it is bound in the wax, thereby reducing the bioavailability of fluvalinate (pers. comm). Most early studies did not find significant effects of fluvalinate upon the bees. Duff and Furgala (1992) tested the effects of fluvalinate on mite-free colonies, and found no significant differences in queen acceptance, queen survival, or colony productivity. Ali, et al. (2001) did not find any effect by Apistan on worker longevity of hybrid carniolans. A study by Westcott and Winston (1999) compared bee populations, brood area, and honey production in colonies that received no Apistan, the recommended treatment, or extended treatment. Unfortunately, because their sample size was very small, and measurements only taken twice, they found no significant differences. However, when I inspected their original data, I came to a very different conclusion! Although the differences were not statistically significant, the control colonies built up much faster, had more brood, and produced far more honey! Queen breeders were the first to note serious problems with miticides and bee health. First fluvalinate was demonstrated to knock the snot out of drones (Rinderer, et al. 1999; Sylvester, et al. 1999). Later, coumaphos was found to be hell on queens (Haarmann, et al. 2002; Pettis, et al. 2004; Collins, et al. 2004). Indeed, some combs became so contaminated with coumaphos that queens would die. Today, some commercial beekeepers are noting that fresh packages do not thrive, or may even fail, on some old combs. They strongly suspect that chemical contamination of those combs by off-label use of miticides is the cause, and are therefore rotating fresh combs into the broodnests. Currie (1999) studied queens and attendants shipped with fluvalinate queen tabs. He found significant worker mortality and sublethal effects on queens after three days of exposure to 1 percent fluvalinate active ingredient. Queen mortality increased after seven days exposure. A 3-day exposure resulted in a 67 percent increase in supersedure rate than found in control queens or those exposed for seven days. The latter anomaly is apparently due to so-called “weaker queens” being killed or damaged by the tabs prior to and/or during introduction. Once introduction was successful, no difference was seen in either queen survival or colony brood production. Nasr and Wallner (2003) found coumaphos in 83% of New Jersey honey samples in 2001, and determined that coumaphos accumulates residues in the wax faster than fluvalinate. High levels were found in colonies “where failing queens were found and sublethal toxicity to bees were observed.” Pettis (2007) will soon be releasing data finding a 16% reduction in lifespan of worker bees following exposure to coumaphos in combs. The decoding of the honeybee genome provided us the surprising fact that compared with flies, the honeybee has 30–50% fewer genes encoding the carboxylesterase, cytochrome P450, and glutathione S-transferase enzymes that are principally responsible for the metabolism of pesticides and in which the great majority of metabolic resistance mutations have been found in other species of invertebrates (Anon. 2006). One big question is whether the miticides affect the bees’ immune systems. The only “smoking gun” I’ve found is an eye-opening paper by Otteni and Ritter (2004). These researchers set up sister colonies, treated one with Apistan for two weeks, and left the other untreated as the control. They then individually inoculated pupae with acute paralysis virus (APV), and compared survival of pupae from the Apistan-treated colonies to the controls. Results? The control pupae fared much better: 73% survived, compared to only 31% of those that had been exposed to a very small amount of fluvalinate through contact with nurse bees while they were being fed as larvae! What a dilemma this places the beekeeper in! If varroa levels get high, viruses go epidemic and kill the colony. But by applying an acaricide to control varroa, one might simultaneously be making the bees even more susceptible to the virus. OK, how about a reality check? Over a million chemically-treated colonies were moved into almonds this year. Sure, some crashed, but many were thriving, despite, and possibly because of, chemical treatments. When I used Apistan years ago, my colonies thrived. I’ve spoken with many beekeepers who currently are using amitraz perhaps 9-12 times a year, in rotation with fluvalinate, formic, thymol, or other treatments. No one is using coumaphos, and sales of it in California are minimal. These are long-time beekeepers who are keen observers I’d love to tell you that my bees look as healthy as they do this spring due to my nonchemical approach, but my chemical buddies’ bees are also looking great! Is overuse of miticides causing Colony Collapse Disorder? Hive chemicals were a prime suspect. However, the CCD research team has not found any correlation between any specific miticide use and colony collapse to date. On the other hand, the challenges of multiple miticide exposures likely add to general colony stress, and may affect the bees behaviorally, immunologically, pysiologically, and metabolically. Clearly, coumaphos is very rough on queens, and rough on workers, and resistant mites are common. Fluvalinate is rough on drones, and may have some sublethal effects and immune response issues. Fluvalinate-resistant mites are also common. Amitraz, though not registered for use in the U.S., shuts down the queen’s egglaying temporarily, but does not appear to cause other major problems. Amitraz appears to be less effective than it was a few years ago. Beekeepers who use the latter two chemicals judiciously, and don’t ramp up the dosages, appear to be keeping thriving colonies. The effects of miticides in the colony appear to lie somewhere between the Chicken Little shouting that they are the cause of all our problems, and the chemical industry’s soothing assurance that colony health is dependent upon them. My current opinion (subject to revision) is that beekeepers who choose to use synthetic miticides should dump coumaphos, avoid repeated use of fluvalinate, especially in high doses, perhaps try Hivastan, or better yet, give the bees a break by using one or more of the “natural” treatments that we know don’t leave residues in the combs (remember, I’m not dispensing pesticide advice—consult with the proper authority). OK, so you’ve used a bit too much coumaphos or fluvalinate (toxic contamination of combs is roughly in the order (least to most) amitraz, fluvalinate, coumaphos, with fenproximate an unknown). How badly are your combs contaminated? Neither product breaks down quickly, and can’t be washed out. They build up in combs closest to the point of application—usually in the brood nest. They don’t usually get much into the honey supers. Replacement of the most contaminated combs is likely the most practical solution. There is little transfer of chemicals back from residues in the box walls (Imdorf, et al. 2003). Some beekeepers are setting the flails of their uncappers deep, and running the combs through to remove the cells down to the foundation. I know of no data that confirms the effectiveness of this procedure, but the freshly-drawn replacement cell walls would likely have lower chemical titers. In any case, rotation of old combs out on a regular basis is probably a good idea for several reasons, as I detailed in a previous article. Note from the author: Dear Readers, thank you for your feedback on this series of articles. However, I’m sorry if I’ve misled anyone to think that I am any sort of “model” beekeeper. In my own operation, one law reigns supreme—Murphy’s. Anything that can go wrong, does, and with distressing regularity. The time that I’ve taken to properly research these articles, and then to hammer on the keyboard until they make some sort of sense has come at the expense of my own small commercial operation. My two hard working assistants, Chaos and Entropy, have had to make do largely on their own, and it shows. In other words, I’m a very poor model of a good model. I want to thank all the hard-working researchers worldwide who have devoted so much of their lives to finding solutions to the mite problem, and who have been generous in answering my many questions. I’m in awe of the skill, cleverness, and perseverance of the progressive and innovative beekeepers who, despite the mite and all the rest of the problems of the industry, are running profitable operations. I’m honored to be one small part of this beekeeping community! The consumer, and the Department of Agriculture, are justifiably concerned about the contamination of honey. Luckily, most synthetic acaricides do not contaminate honey to any great extent (Bogdanov, et al. 1998; Tsigouri, et al. 2003). Of the common miticides used in the U.S., coumaphos is most likely to leave a residue in honey, fluvalinate less so, and amitraz is the least likely. Additionally, there are any number of other chemical contaminants occasionally found in honey, due to surreptitious experimentation with unapproved formulations for mite control. This fact is of especial concern, since beekeepers may erroneously think that using, say, fluvalinate in Mavrik is the same as using fluvalinate in Apistan. As pointed out by Eric Mussen (1992), approved formulations, such as Apistan, are carefully developed to ensure a minimal likelihood of leaving a residue in honey. Agricultural formulations of the same active ingredient, on the other hand, generally include emulsifiers, stickers, spreaders, synergists, and other performance-enhancing chemicals. These may increase the solubility of the active ingredient into honey, as well as cause additional contamination of their own. Adee Honey Farms made headlines in December 2006, when the Minnesota Dept. of Agriculture fined them $14,000 for using fluvalinate and oxalic acid on shop towels. A punitive fine for unapproved chemical use may be the least of our worries. Remember when California spinach growers had to plow their crop into the soil when the market for fresh spinach collapsed during the E. coli scare last year? Or the apple market crash due to Alar contamination? Beekeepers would do well to note the recent development in the California milk market. The state’s largest dairy cooperative recently announced that it would no longer accept milk from dairies whose cows were treated with rBST, a synthetic hormone used to boost milk production, and a staple of the industry. This decision wasn’t based upon scientific research or governmental regulation—it was solely due to the whim of consumers. 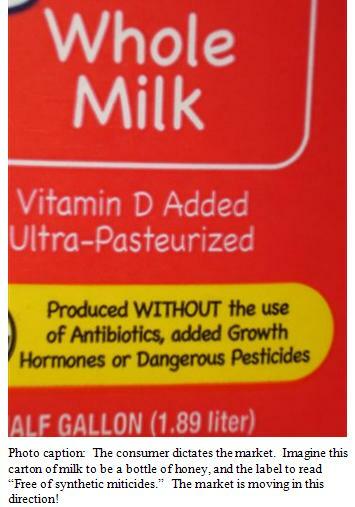 The Starbucks chain simply announced that its customers wished the dairy products used in their coffee to be “rBST free.” This is a misleading term, since, according to Monsanto no rBSTcan be found in the milk of treated cows. Nevertheless, any dairyman using rBST can no longer sell his milk to the coop. What will happen when the consumer starts demanding “chemical free” honey, when we now have instruments that can detect miticide residues in parts per trillion? Picture, if you will, a supermarket shelf of various brands of honey. One producer who uses no synthetic miticides puts a bright orange “Free of synthetic miticides” label on his jars. The implied message is that the other honey brands contain traces of miticides (as well they may!). Which brand is the consumer going to purchase, and which will collect dust on the shelf? Are you prepared should your honey buyers suddenly state that they would no longer accept honey with any traces of synthetic miticides? I was recently at the research proposal submissions committee meeting at a state beekeepers convention. The old-school beekeepers were hoping for a new round of silver bullets. The researchers were saying, “That’s so yesterday, we’re bored with screening for chemicals. Postdocs are looking for sexier scientific research to polish their resumes.” Unfortunately, some of the big beekeepers were afraid that they were losing the battle to the mites (I noticed that they were also the ones standing in the hall chatting and sipping coffee while cutting-edge research on mite control was being presented inside). It appears to me that beekeepers are going to have to entertain the idea of changing the ways that they’ve been dealing with the mite. I’m not suggesting that commercial operators forswear all miticides. That would be unrealistic for me, and foolhardy for you. I’m just suggesting that you start to ease in a few trials of alternative mite management methods. If you’re already opening the lid to treat your colonies with off-label chems a dozen times a year, perhaps you could give the bees a break by spending a few extra seconds and instead trying drone trapping, sugar dusting, or using a natural alternative such as formic acid. 1. Don’t hurt anyone else—don’t contaminate honey that’s going to be sold to an unsuspecting buyer, don’t poison your employees or explorative children, and don’t contaminate the environment. 2. Don’t hurt your bees or contaminate your equipment in your quest to kill mites. 3. Don’t hurt yourself—the degree of risk that you wish to take personally is up to you. Of course, you should only use approved, registered formulations that have been tested for safety, efficacy, and lack of honey contamination. Of course, many beekeepers, due to lack of efficacy of the registered treatments, the relatively high cost of registered treatments as compared to the ag formulations, or for other reasons, will use unapproved treatments. If you do so, please be careful, and don’t screw it up for the rest of us! A big problem with the approved treatments is the cost of development and registration, which needs to be recouped by the manufacturer through sales to a relatively small market. The commercial beekeepers, which would constitute the largest share of the market, are the first to skip straight to an off-label formulation, saving tens of thousands of dollars. Perhaps the manufacturers would realize greater sales if they cut their profit margin per unit treatment a bit. Be careful about tweaking label recommendations. For example, when I published my review of oxalic dribble, I very carefully detailed the findings of dozens of field trials. Then I specified the exact recommended concentrations and dosages that were found to be effective, yet not overly harmful to the bees. Some beekeepers immediately tried to simplify the recommendations and hurt their colonies. Please note that recommendations based upon exhaustive research should not be taken lightly! Follow directions exactly. We are often dealing with chemicals that have a very narrow range of tolerance between effective mite control and colony harm. Some chemicals are relatively safe to handle, such as Apistan strips. Some can be dangerous irritants or corrosives that can cause tissue damage, blindness, or death, such as formic or oxalic acids. Some are insidious toxins that may affect you for the rest of your life, such as coumaphos. Follow safety precautions exactly! Do not use strong miticides on a routine calendar basis—this promotes development of mite resistance. We should keep them in reserve, just as doctors won’t use the current “antibiotics of last resort” unless absolutely necessary. They know that if they are used freely, they soon will no longer kill the nastiest bacteria. Beekeepers desperate to save their colonies sometimes resort to desperate measures. Don’t let your colonies get to the point of desperation, and don’t desperation cloud your judgment! Ali, MA, M.K. Eshba, A.R. Hassan, and A.A. El-din. (2001) Control practices of Varroa jacobsoni Oud. using Apistan with special reference to its effect on worker longevity and its residues in wax and honey. Acarology—ESA Annual Meeting. Anon (2006) Insights into social insects from the genome of the honeybee Apis mellifera Nature 443, 931-949. 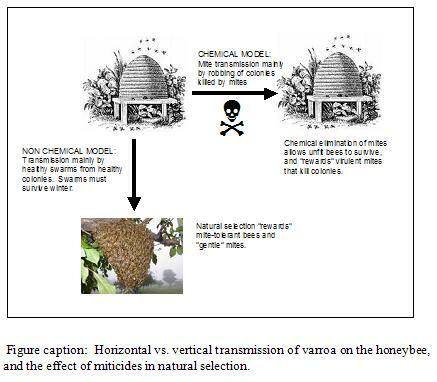 Bogdanov, S, V Kilchenmann, A Imdorf (1998) Acaricide residues in some bee products. J Apic Res 37(2): 57-67. Bogdanov, S, V Kilkenmann, U Butikofen (2003) Determination of acaricide residues in beeswax: collaborative study. Apiacta 38: 235-245. Collins, AM J Pettis, RR Wilbanks and M Feldlaufer (2004) Performance of honey bee, Apis mellifera, queens reared in beeswax cells impregnated with coumaphos. Journal of Apicultural Research 43(3): 128-134. Currie, R. (1999) Fluvalinate Queen Tabs for Use Against Varroa jacobsoni Oud. : Efficacy and Impact on Honey Bee, Apis mellifera L., Queen and Colony Performance,” American Bee Journal, Vol. 139(11): 871-876. Reviewed by Malcolm Sanford. Duff, S.R. and Furgala, B. (1992) Some effects of menthol and fluvalinate on mite-free honey bee (Apis mellifera L.) colonies. American Bee Journal 132: 476-477. Fries, I, K Wallner, P Rosenkranz (1998) Effects on Varroa jacobsoni from acaricides in beeswax. J Apic Res 37(2): 85-90. Haarmann, T, M Spivak, D Weaver, B Weaver, T Glenn (2002) Effects of Fluvalinate and Coumaphos on Queen Honey Bees (Hymenoptera: Apidae) in Two Commercial Queen Rearing Operations. J Econ Ent 95(1): 28-35. Henderson, C. (1988) Tests of chemical control agents for Varroa jacobsoni in honey bee packages. In Needham, G.R., et al. (Eds. ), Africanized Honey Bees and Bee Mites. Pp. 380-386. Gassner, B, A Wüthrich, G Scholtysik and M Solioz (1997) The Pyrethroids Permethrin and Cyhalothrin are Potent Inhibitors of the Mitochondrial Complex I. Pharmacology 281 (2): 855-860. Goodwin, R M, Taylor, M A, Mcbrydie, H M and Cox, H M. (2006) Drift of Varroa destructor-infested worker honey bees to neighboring colonies. Journal of Apicultural Research 45(3): 155-156. Imdorf, A, V Kilchenmann, R Kuhn, S Bogdanov (2003) Beeswax replacement in organic beekeeping. Is there a risk of contamination by residues in hive walls? Apicacta 38: 178-182. Liu, TP (1992) Fluvalinate and its after-effects. ABJ 132: 398. Milani, N & GDVedova (2002) Decline in the proportion of mites resistant to fluvalinate in a population of Varroa destructor not treated with pyrethroids. Apidologie 33: 417-422. Mutinelli, F & A Baggio (2004) Use of medical drugs against varroosis. Apicacta 39: 53-62. Otteni, M & W Ritter (2004) Acute-paralysis infection of bee brood (Apis mellifera L) from colonies treated with tau-fluvalinate. Apiacta 39:83-90. Pettis, J. (2004) A scientific note on Varroa destructor resistance to coumaphos in the United States. Apidologie 35: 91-92. Pettis, J, AM Collins, R Wilbanks and M Feldlaufer (2004) Effects of coumaphos on queen rearing in the honey bee, Apis mellifera. Apidologie 35: 605-610. Pettis, J (2007) pers. comm. By permission. Pridgeon J.W. ; Appel A.G.; Moar W.J. ; Liu N. (2002) Variability of resistance mechanisms in pyrethroid resistant German cockroaches (Dictyoptera: Blattellidae) Pesticide Biochemistry and Physiology 73(3): 149-156. Rinderer, TE, L de Guzman, V Lancaster, G Delatte & J Stelzer (1999) Varroa in the mating yard: I. The effects of Varroa jacobsoni and Apistan® on drone honey bees. ?ABJ 139(2): 134-139. Shroeder, A, K Wallner, D Weber (2004) Amitraz als Varroazid—Einfluss auf die Honigqualitat. Rpt of the 51st seminar in Munster, Assoc. of Inst. for Bee Research. Apidologie 35(5): 523. Sylvester, HA, RP Watts, LI deGuzman, JA Stelzer, TE Rinderer 1999 Varroa in the mating yard: II. The effects of Varroa and fluvalinate on drone mating competetiveness. ABJ 139(3): 225-227. Tsigouri, et al. (2003) Fluvalinate residues in Greek honey and beeswax. Apiacta 38: 50-53. Vesely, V, D Titera, J Lenicek, M Sekyra (2004) Amitraz and its residues in beeswax after 20 years of Varroa treatment in the Czeck Republic. First European Conference of Apidology, Udine 19-23 Sept 2004. Wallner, K (1999) varroacides and their residues in bee products. Apidologie 30: 235-248. Westcott, Lynn C., M.L. Winston 1999. Chemical acaricides in Apis mellifera L. (Hymenoptera: Apidae) colonies: do they cause non-lethal effects? Canadian Entomologist 31:363-372.